Anglesey Sea Zoo AquariumA visit to Anglesey Sea Zoo is an exciting opportunity to come face to face with some of the fascinating fish and sea life that live around the coast of Britain. From Conger eels to Octopus, our aquarium is packed with over 100 different species on display. With regular talks and fish feeds with our biologists there is always plenty to entertain young and old. A visit to Anglesey Sea Zoo is an exciting opportunity to come face to face with some of the fascinating fish and sea life that live around the coast of Britain. Open from February half term to the end of October half term, during the winter months open for pre-arranged group bookings. Open 10am - last entry 4.45pm. Please check website or call to confirm up to date opening times. Adult £7.75, Child (age 3-15) £6.75, Seniors £7.25, Students £7.25. Children under 3 get in for free! 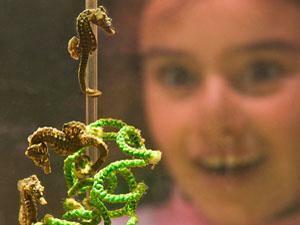 Family tickets available, group discount for 10 or more paying visitors. All tickets valid for 6 days after day of purchase (not transferable). We're easy to find. Travelling on the A55 you will need to cross the Britannia Road Bridge onto Anglesey. Then simply follow the brown lobster signs from there towards Brynsiencyn. The Zoo is about 10 minutes from Llanfairpwll. See website for map.